Service Desk Metrics -- Are We Having a Good Day or a Bad Day? When you’re asked how your Service Desk is performing, what do you say? What data, trends and stories do you share, and what does it all actually mean? You don’t really want to show pretty charts and graphs with a multitude of figures. You do want to show the value your Service Desk delivers and the contribution it makes to achieving business goals. Now, that’s music to management ears. 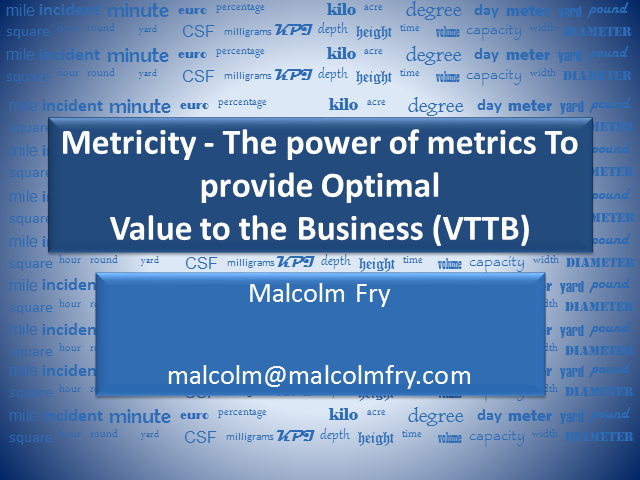 Join Malcolm Fry for an insightful discussion on how you can use data and metrics to tell compelling stories that highlight success and true business impact. Malcolm is a recognised IT industry luminary with more than 40-years-experience in Information Technology. He brings an unparalleled breadth of knowledge and experience in IT business and technical issues. He is the author of many publications on IT service and support and is currently a member of the ITIL Advisory Group (IAG), which is responsible for overseeing Version 3 of the core ITIL publications. Want to up your service desk management game? Want to know what makes a great service desk manager? And do these great managers really have any secrets? Join us for a lively panel, moderated by Phil Gerbyshak, that will share at least 7 (not so) secrets of great service desk managers, and how YOU can implement them into your service desk management practice. Prior to being a Social Media Guru, Phil lead a service desk at a financial services organisation. He has been heavily involved in HDI for years and years. Mike is currently Cherwell EMEA's Learning Services Manager and PSO Manager. Prior to joining Cherwell, Mike lead a global service desk team at Dolby. Michael is currently a Service Managment Consultant with Bright Horse. Prior, he was a Technical Services Consultant for Cherwell Software and before then, was a Service Desk Manager with First Rate. Brandon is a former Senior IT Support Manager and has been actively involved with HDI for years and years. He currently spends his professional life focused on improving the customer experience. John will step through the process and application of Continual Service Improvement. This will be a down to earth session with real world advice and guidance based upon his 20+ years’ experience within the ITSM Industry. This session will be about learning and discussing ideas and how to approach the often overlooked process of CSI. The format of the session will be fun and informative so if you want to explore the wonderful world that is CSI please join us! For many IT Service Organisations the selection of their ITSM toolset is one of the most important, and expensive, decisions they can make. Causing huge disruption and extra work as staff are moved from one system to another. The ITSM toolset is like the engine that drives an IT department and its ability to ensure work is prioritised, integrated and moved between support teams. It is utterly critical to the running of an IT department, but if it’s so important, why do so many IT departments only keep a toolset for 3-5 years before moving to another one and starting the process again? Join Peter Hubbard, Principal ITSM Consultant at Pink Elephant, as he shares his experiences on how to pick an ITSM toolset. This webinar will cover how to pick a toolset, the value of use cases, what happens on the vendor ‘demo day’ and what sort of actions you can be undertaking prior to the chosen vendor starting their implementation in order to speed up the process and make sure that your most expensive ITSM decision returns real value. Bring your own device (BYOD) is a burning topic in many organisations. Driven by the allure of cost savings, end-user satisfaction and improved productivity, many organisations are allowing users to bring their own devices into the work environment without considering the implication of BYOD on software licensing costs, license compliance and IT asset management issues. Successful IT asset managers need to proactively manage these scenarios. In this webinar we will discuss the potential pitfalls to BYOD and how IT Asset Manage risks and accommodate BYOD in their ITAM strategy. Are you tired of gathering reports and data points for your boss, only to have those reports go right in the trash can? Do you have sleepless nights wondering if the work you do is really appreciated by those you serve? Then you need to start focusing on the right metrics - business focused metrics. Join Phil Gerbyshak as he shares how to report on metrics that really matter. The business focused metrics matter more. You'll learn what they are, how to find them, and how to create reports that your boss and your business actually care about. Adopting new technologies often require adopting new strategies but one consistent factor is the continuance of proper monitoring and metrics. OK DevOps, cloud and agile are not exactly new but they have not been as exploited as much as as traditional suites services where monitoring and metrics play a significant part. So what are the important considerations for metrics and monitoring cloud, agile and DevOps? Are monitoring and metrics being neglected and if not then exactly what should we measure using these approaches? IT has a huge amount of statistics, but are they just pointless or do they provide a basis for the progression and management of service? During this webinar, we will discuss three distinct approaches that can help us to better manage and control our IT services: delivering the deliverables, performance versus quality, component criteria optimizing. There is no silver bullet for what needs to be measured, but understanding the three key approaches can clear your thoughts and allow you to refocus rather that use the same old stats raised by a previous ITSM generation. It is not a case of breaking the mould but a case of producing new and better metrics. Join this webinar to refocus and revisit your stats and metrics. Chris Wiggins, IT Helpdesk Manager from the University of Colorado at Colorado Springs tells how Cherwell Service Management has helped them with self-service password reset. Wher the system first went live, 670 people to reset their passwords within the first 48 hours. Are you a new service desk manager who was thrown into the fire with little or no training and no idea what to do with your team? Have you been leading a team for a while and lost some or all of your passion for the work? Are you a manager who needs validation that you’re doing things in the most effective way? Join Phil Gerbyshak as he shares his "crash course" to your service desk management success with lessons, insights, top tips, and more. Problem Management is much discussed and lauded as one of the key ITSM processes - the 'game changer', the 'value creator', etc. However, very few organisations actually practice it or practice it well and get value back from it. The reasons for this can vary from lack of understanding and clarity about the practical activities and responsibilities required, prevarication, over-engineering, focus on other priorities, etc. However, often it is good just to make a start and take some actions to get the process moving, accepting that it might not be perfect first time and expecting to learn from mistakes. This webinar provides some real world advice and example of how to make this function/process/role/activity (maybe it's not just a process?) work with some examples and proven ideas for success. Barclay Rae is an independent management consultant and an experienced ITSM mentor and business manager. During the past 25 years, he has worked on approximately 500 ITSM projects. He started his career on the operations side of IT, setting up and running Helpdesks / Service Desks. There’s a sea change taking place in service and how consumer ‘journeys’ are taking place. Howard Kendall, founder of the SDI, has spent much time keeping track of what is really going on, how customer expectations are changing, and how we can use leverage this in the service desk industry. Join Howard for an informative discussion on how service desk can successfully rise to the challenge of delivering excellent customer service, meeting, and possibly surpassing, the expectations of the customers they support. Howard will provide some top tips that will help to win the hearts and minds of service desk customers and build stronger relationships with end-user constituents, elevating the position of the service desk within the IT organisation. A service catalogue does more than simply list the IT services an organisation provides. It helps IT engage with its customers and build and maintain relationships. It helps to establish boundaries and to set expectations. It helps to transform IT to a service lead organisation. It helps IT to find solutions, contribute to the bottom line and demonstrate business value. The service catalogue should be a ‘living’ catalogue where services and support levels can be added and removed as required. Requests for new services, when approved, need to be incorporated into the service catalogue. Listing to the business and its technology needs, now and upcoming, will better align IT with the business, helping the service desk to show real business value and helping to position the service desk as a true business partner. To make this happen, alongside the service catalogue should be a detailed plan outlining the Change Management and Request Management process. The first of its kind and recently published UK Higher Education Service Desk Benchmarking Report captures the challenges and accomplishments of service desks within the UK higher education sector. With increased tuition fees, funding cutbacks, a student population born at the start of the Internet era and the consumerisation of IT, this sector faces a number of tough challenges, including high customer expectations. Join Sally Bogg, Service Desk Manager at the University of Leeds, for an informative overview of the report results. Learn in which areas IT helpdesk at UK universities are leading their wider industry peers and where they are playing catch up. We all have our preferences when it comes to what type of car we drive. The reality is that a manual and automatic are equally good so it depends on what you are after. The same applies to IT Service Management. In today’s cost-cutting approach to business, it is easy to assume that an ‘automate everything’ approach is the way to go. But can automation be too much? Can customer service suffers? This session will look at considerations that should be accounted for when developing a strategy to automate services. How is your service desk performing? What trends, stories and metrics do you share? Is it time for a change? Join Malcolm Fry for an insightful discussion on how to break free from the past, how to stop going around in circles and how to change your behaviour in regards to your service desk metrics. He will also provide 10 slimming opportunities so you can cut the fat and focus on what matters to your organisation. Malcolm is a recognised IT industry luminary with more than 40-years-experience in Information Technology. He brings an unparalleled breadth of knowledge and experience in IT business and technical issues. The failure rate of organisational change projects, such as implementing IT Service Management (ITSM), has stayed at a steady 70% for almost 20 years. So by simple process of deduction, anyone undertaking an ITIL implementation project is almost twice as likely to fail as they are to succeed. It's a small wonder the amount wasted in failed projects in this area topped $55 billion a year in the US alone. The number one reason given by organisations as to their failure has remained constant for the whole period – resistance to change by the people who must carry out the work. During this webinar, Pink Elephant Principle Consultant Peter Hubbard will take you on a journey through the likely Attitude, Behavioural & Cultural issues your ITSM implementation will face, as well as some steps you can take to mitigate those risk and ensure your change project is successful. Changes usually get bad press. It takes the blame whatever goes wrong and is often used as a cover for other more fundamental reasons for failure such as bad planning or lack of testing. So, are changes really the root of all evil? Of course not. Well planned and carefully executed changes can have a very positive effect, and what’s more, you can exploit the benefits. However, you do need the essential basics: early change notification, a solid change process and good communications to manage the status and progress of your changes. This informative webinar with Malcolm Fry looks at the positive effects changes bring, many of which are unexpected. Service Desk professionals recently told us that 'increasing value to the business' is a key priority for any Service Desk and that 'managing customer expectations' remains a significant pain-point. A Service Catalog can tackle both these points. This is what we offer. This is how we can help. If there's something else we can help with, let us know. This webinar provides top tips for creating and managing an effective Service Catalogue that benefits the Service Desk and the customers it serves. Learn more about IT Service Management (ITSM) from industry experts, Cherwell Software customers, industry influencers and guests. Title: Service Desk Metrics -- Are We Having a Good Day or a Bad Day?